A few weeks ago, I was making a banana coffee cake with a peanut butter glaze and the idea for these rolls popped into my head. I guess technically the idea was for them to be a breakfast roll, but they are SO SO sweet they work great as a dessert. 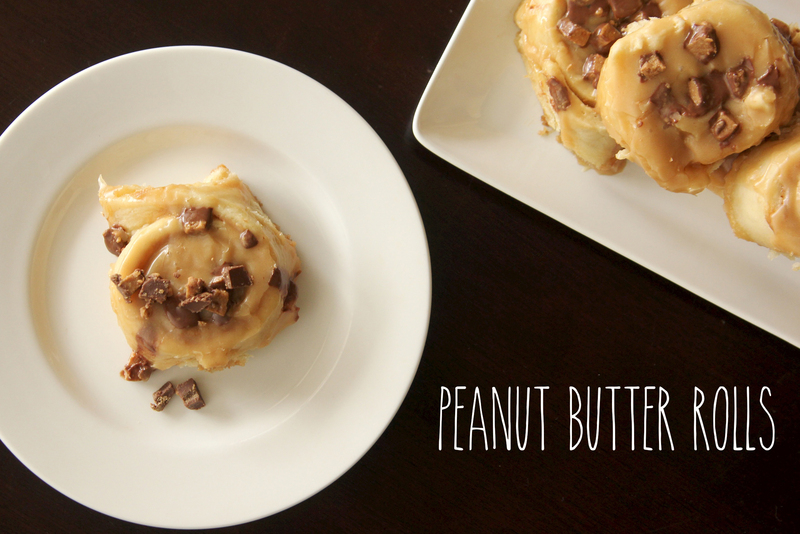 These have been taste tested by some of the toughest peanut butter critics I know…and they highly approve. Additional chopped peanuts or Reese’s peanut butter cups for topping. Combine milk and butter in a small sauce pan. Heat over medium low heat, stirring until the butter is melted and the milk is warm to the touch but not hot. In the bowl of a stand mixer fitted with the dough hook attachment, add 3 cups flour, yeast, sugar and salt. Stir by hand to combine. Add the egg and milk mixture, and beat on medium-low speed until combined. Add the remaining flour, 1/4 cup at a time, beating after each addition until incorporated. When the dough begins to form a ball and pulls away from the sides of the bowl, you have added enough flour (I used all 3 1/2 cups). Continue beating for 5 minutes on medium-low speed (speed 2 on the KitchenAid). Remove the dough hook and cover the dough with a damp towel and let rest for 10 minutes. When the dough is ready, turn it out onto a floured work surface. Then use a floured rolling pin to roll the dough out into a large rectangle, about 14 x 9 inches in size. Use a knife or a spatula to spread the 3/4 cup of peanut butter out evenly over the entire surface of the dough. Next, spread the melted butter over the peanut butter. Then sprinkle the brown sugar evenly over the peanut butter and butter. Beginning at the 14-inch edge, tightly roll up the dough. And then give the final seam a little pinch so that it seals. Use a serrated knife to cut the remaining dough into 11 or 12 equal pieces. (11 rolls seem to fit in a pie plate, while 12 rolls fit in a rectangular pan. Place each of the cut peanut butter rolls into a greased pie plate or 9 x 13-inch baking dish. I like to drizzle an additional 1/4 cup of melted butter over the rolls at this point. Then cover again with a damp towel, and leave the dish in a warm place to rise for 1 hour (dough always takes longer to rise in my house, so I let the rolls rise for two hours, they were perfect). Either in the bowl of an electric stand mixer, or a mixing bowl, beat softened butter and peanut butter together until combined. Then beat in powdered sugar. Add vanilla and milk. If the icing is too thick, add a tablespoon or two of milk to thin. Top with chopped Reese’s peanut butter cups or peanuts. This entry was posted in Breakfast and tagged Breakfast, cinnamon rolls, Peanut Butter, Rolls. Bookmark the permalink.